Stay in CONTROL and make the most informed Revenue Cycle decisions. Get valuable performance metrics with VARO's self-pay and insurance-found reporting. 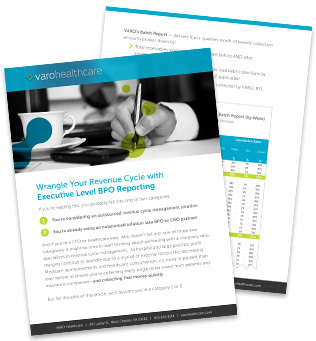 VARO will manage your revenue cycle activities and results so you can focus on what really matters—the ability to deliver quality care and services to patients. Download this free guide to view sample VARO reports and get an inside look at the metrics VARO gives its clients.